Since the year 2005, a RopeCon system has been transporting inert material which is used for backfilling a long-stretched valley at the Tüfentobel landfill site near the city of St. Gallen, Switzerland. 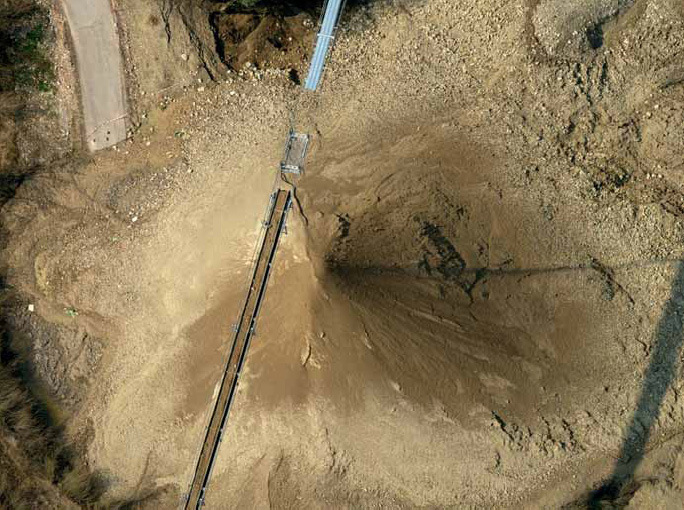 The belt conveyor discharges the material onto a pile directly where it is to be used. In March 2013, a new tower was installed along the line and the discharge point relocated. This article describes the extension of RopeCon and the general effects of this specific transport system on the operation of the site. After many months of intensive planning and research to determine the ideal way of extending the Tüfentobel RopeCon, an additional support structure was finally erected, and the discharge point relocated to further down the line, in early 2013. The process required shifting the discharge drum and splicing an additional piece of texture into the existing belt. The new discharge point of RopeCon is now at 980m. In the course of this extension, an additional tower was erected which is special in that, due to the difficult soil conditions, it has not been anchored directly underneath RopeCon but somewhat offset, therefore protruding into the line. The new tower is 50m long and makes it possible to bring the belt to 38m above ground in that area. Additionally, with this design the inert material can be worked into the ground directly underneath the belt. A phased relocation of the discharge point had been provided for in the design and planning work right from the outset, so that the material would always be discharged very close to where it was needed. In 2010, RopeCon was extended for the first time and by 220m. However, the new area was backfilled quickly and another relocation became necessary two years later. With this latest extension, the discharge point was relocated even beyond what was envisaged for this phase. This change takes into account the increase in material delivered to the landfill and, depending on the actual volumes, will allow backfilling to continue for another six to eight years without further modifications. RopeCon as a means to transport inert material forms part of the expansion project of the Tüfentobel landfill site with the aim of developing new landfill space. 5.3 million cubic metres of additional volume have been gained by backfilling the long- stretched valley. Without the expansion, the site’s capacities for taking up inert material would haven been exhausted by 2004. With the new landfill space, operation of the site has been secured for several decades. In May 2003, the ‘Grosser Gemeinderat’ (Great City Council) decided in favour of an expansion of the landfill site. In November that same year, the voters approved of the expansion project with a majority of more than 92%. The expansion project presented to the Council and to the public investigated, among other things, different aspects of the transportation concept. The following goals had been defined: subsequent recultivation of the landfill site in several stages, low operating costs, safe operation, minimal exposure of residents to emissions, and optimal logistical delivery conditions. One of the transportation concepts under review considered using RopeCon to transport the inert material from one dumping point near the landfill site entrance to the opposite end of the valley which is to be backfilled. The RopeCon system combines important features of conventional belt conveyors with well proven ropeway technology. The system was developed by the Austrian ropeway manufacturer Doppelmayr. RopeCon essentially consists of a continuous flat belt with corrugated side walls and supporting axles arranged at regular intervals. Running wheels are fitted to either end of the axles and travel on a track of steel ropes. These steel track ropes are guided over tower structures, similar to a conventional ropeway system. The whole system is thus elevated off the ground and can easily cross obstacles or difficult terrain. The belt performs the haulage function and is driven by a drive drum at one end and guided around a return drum at the other end. 3.1. Step-by-step backfill and recultivation of the landfill site The concept of backfilling and recultivating the site in various steps is in line with the site’s declared goal to avoid to the furthest possible extent any detrimental effects on the environment. It is furthermore in line with the requirements stipulated in Section 34 of the ‘TVA, SR 814.600’ (Technical Ordinance on Waste of the Swiss Federal Council) which states that open surface areas of any landfill site must be kept as small as possible. For example, forests may only be cleared to the extent required for landfill space, and once an area has been backfilled it must be recultivated as soon as possible. For this specific application, RopeCon was designed and built as an extendable system. Several stages, each with a different unloading point along the line, were defined. The support structure, i.e., the track ropes, the rope anchoring systems, and the towers, was mostly built for the final complete length of 1,250m at the outset, while the belt on which the material is transported was initially installed on just one part of the system. The discharge drum which deflects the belt can be relocated. When the proposed degree of filling in a zone has been reached, the discharge drum is repositioned within the track rope span and the belt is extended accordingly. RopeCon then unloads at this new point until once again the proposed degree of filling has been reached. Depending on the actual stage of the project, an additional tower may also be erected. Since RopeCon operates elevated off the ground, it occupies only very little space on the ground (in the area of the towers and of the stations). Bulldozers can continue their landfill operations directly underneath the belt and recultivation can begin straight away. Upon termination of its use, RopeCon can be completely dismantled. As a landfill site gradually fills up, transport distances to the dumping point get longer. Access roads must be adapted to the ever-changing terrain profile and must be maintained accordingly. From the dumping point onward, the material must be distributed and worked into the ground by bulldozers. With RopeCon as the means to transport the inert material into the landfill, the delivery vehicles simply dump the material into a bunker near the site entrance. The belt then takes it from there to the defined discharge point. The discharge point may be chosen independent of the course of the roads so that distances for the bulldozers can be kept as short as possible. This reduces transportation distances for both the delivery vehicles and the bulldozers. The number of vehicle transports into the landfill site area which still require roads (e.g., for specific local fillings, for placing culverts, etc. ), and consequently the strain on the roads, has been greatly reduced. Cleaning of the roads is another cost item: vehicles driving to the dumping point on the unpaved roads of the landfill site soil the public road heavily, especially in wet weather. The one central dumping point at the entrance area however can be reached on paved roads, and the problem of soiling is reduced to the small number of vehicles which are required to take the site dirt roads for the previously mentioned special transports. One goal being considered in the evaluation of the transportation concept was the safe operation of the landfill site not only in terms of landfill technology but also in terms of transport. Wet weather conditions in particular may have an adverse effect on safety. Vehicle transports can become too dangerous in snowy or extremely wet conditions, and in some cases operations at the landfill site may have to stop completely. With RopeCon, such weather-related closures can largely be avoided: there is no need to transport the material over the dirt roads of the landfill site as it can be dumped directly at the site entrance area where the roads are paved. The RopeCon system as such operates fully automatically. A number of residential areas of the town of Engelburg border directly on the Tüfentobel landfill site. Reducing the amount of emissions to an absolute minimum was one of the main goals defined when planning the landfill site. When choosing the transport solution, particular attention was given to noise and dust emissions. By using RopeCon instead of conventional vehicles, noise emissions along the line have been greatly reduced and are now largely limited to the starting and to the end point of the RopeCon line. The end point of the RopeCon line moves along as the landfill site grows. Residents are therefore affected by the actual landfill operations only for a limited period of time. Dust emissions have also been reduced since fewer vehicles are required to pass over the dirt roads. The inert material as such is stationary on the belt. The use of RopeCon as the means to transport the inert material has a number of significant effects on the logistical delivery conditions: one is that transport distances can be kept short. With the rate at which the site is currently filling up, transporting the material to a dumping point somewhere on the site on vehicles would mean a rotation time of approximately ten minutes. If the material is transported to that point on RopeCon, vehicles must drive no further than to the dumping point at the site entrance area. This shortens the rotation time to approximately two minutes. The one central dumping point has another advantage: the vehicles will normally pass only over paved roads. Therefore they do not require washing before leaving the site — the companies save on washing costs. The material can now also be delivered in all kinds of weather, something that might not be possible without RopeCon, particularly in very wet conditions. The operators of the landfill site had originally somewhat reduced their fees, as they expected larger amounts of material to be delivered to the site. The original calculations in connection with the 2003 final project were for material volumes of between 200,000m3 and 300,000m3 per year. It was estimated that the landfill site would have a life of approximately 30 to 40 years. However, the actual annual volume is currently at approximately 600,000m3 to 700,000m3, which reduces the site’s service life to approximately 12 years.